Single-use plastic drinks bottles will be barred from sale at Glastonbury Festival for the first time this year. The bottles will also not be supplied backstage, in dressing rooms or to production and catering staff, according to an announcement on the music festival’s website. 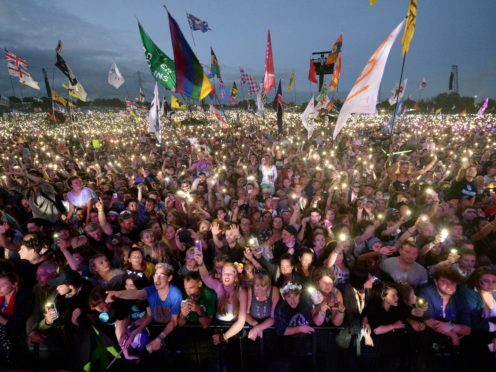 Organisers are encouraging festival-goers to use reusable bottles and refill them at taps around the Glastonbury site supplied with water “of the same quality as your taps at home”. Free drinking water will be available from all bars across the site and the number of kiosks run by charity WaterAid will be tripled. Festival organiser Emily Eavis said: “It’s paramount for our planet that we all reduce our plastic consumption and I’m thrilled that, together, we’ll be able to prevent over a million single-use plastic bottles from being used at this year’s festival. “I really hope that everyone – from ticket-holder to headliner – will leave Worthy Farm this year knowing that even small, everyday changes can make a real difference. Canned soft drinks and canned Life Water will still be available to buy and festival attendees will still be able to bring plastic bottles on to the site. The festival, which takes place in Somerset, runs from June 26 to 30 this summer.